This cake shouts out eat me !!! it is the sight I imagine myself standing in front of the bakery “patisseries” windows (in Mauritius) staring at – nostalgia. 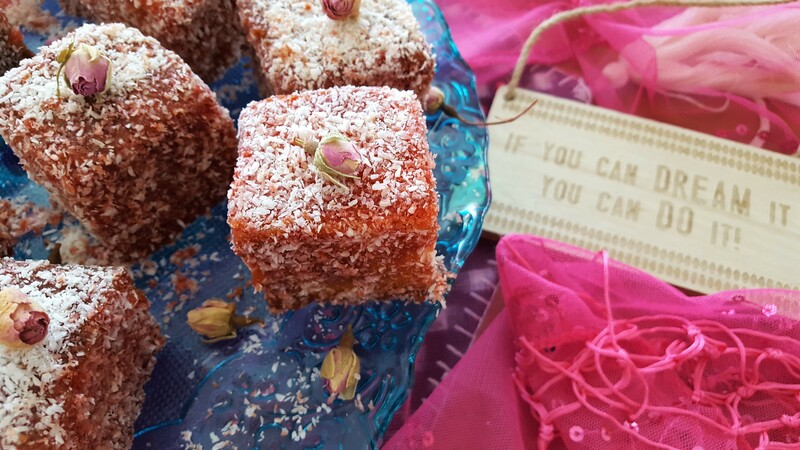 With such vibrant colours, how can anyone resist, covered with coconut, these squares tastes delicious. One bite and you may want to swallow the whole piece of cake in one big mouthful. 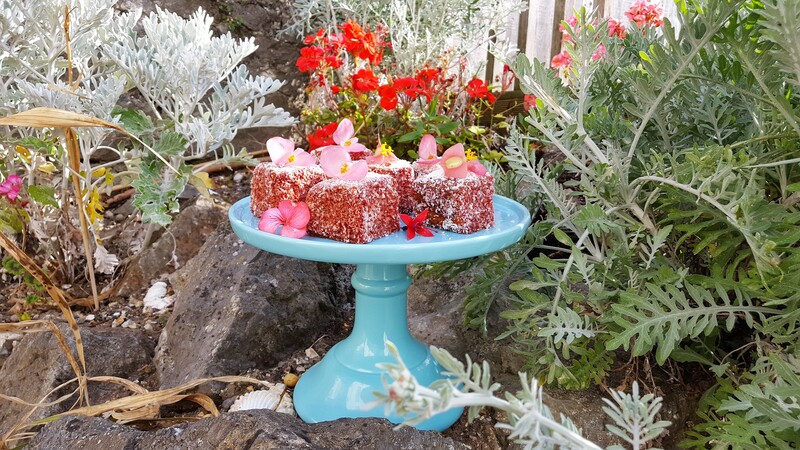 I have had so many requests to share the recipe; we call it simply “Gato Carré Rouge” simply translated into Red Cube Cake. 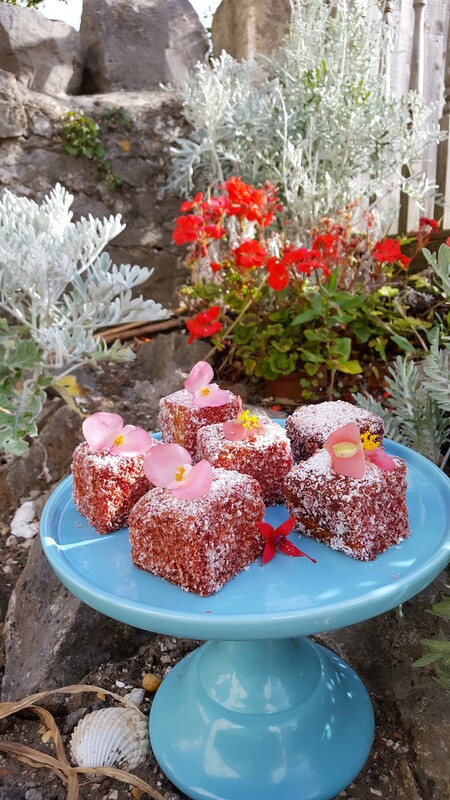 It is in fact a Lamington cake, which is usually covered with chocolate and desiccated coconut, but in Mauritius these beauties are covered in a red sugary sirop and coconut. 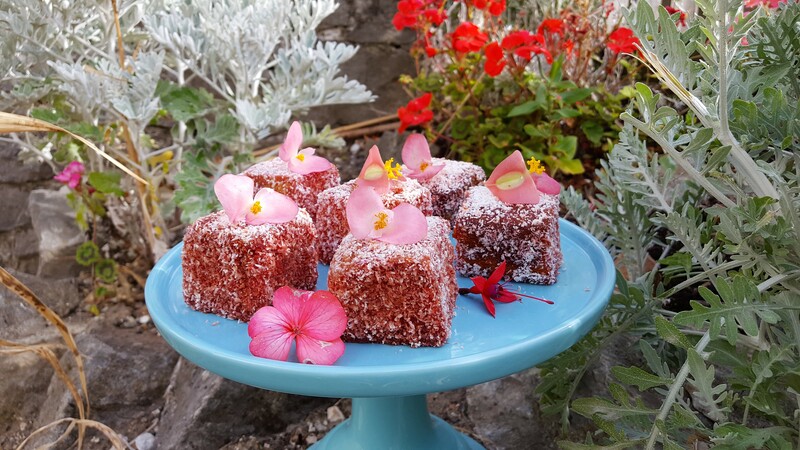 As you read my version of this recipe which I have recreated, I have added lime juice to the sugary coating which I will explain why. Preheat oven to 180 C. Grease and line a 9×9 inch square baking pan with parchment paper. In a bowl sift flour and baking powder together and set aside. Using an electric whisk, cream the butter and sugar together in a large mixing bowl until light and creamy. Add vanilla. Add egg, one by one and beat until thoroughly incorporated. Add the flour alternating with the milk until all the flour has been added. You should end up with a smooth cake mix. Spoon the cake mix into the prepared tin/tray and smooth the top. Bake for 25-35 minutes until golden. Insert a skewer if comes out clean the cake is cooked. Leave to cool in the baking tin for 5 minutes before turning on a wire rack to cool completely. Using a sharp knife cut into squares, leave to cool completely. Put the strawberry jam in a bowl, add warm water and give it a good whisk to break all the lumps and you end up with a runny texture. 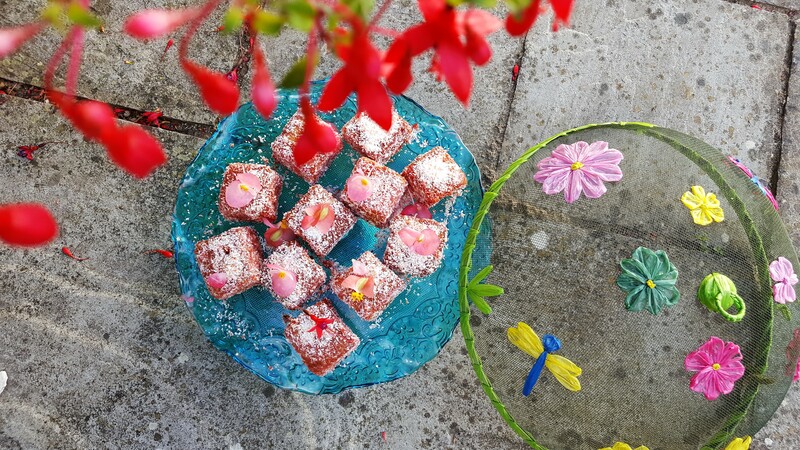 Add the icing sugar a little at a time with the lime juice. Taste for sweetness and adjust as needed. I personally don’t like it too sweet I prefer the little tangy taste. Add the food colouring and mix well. 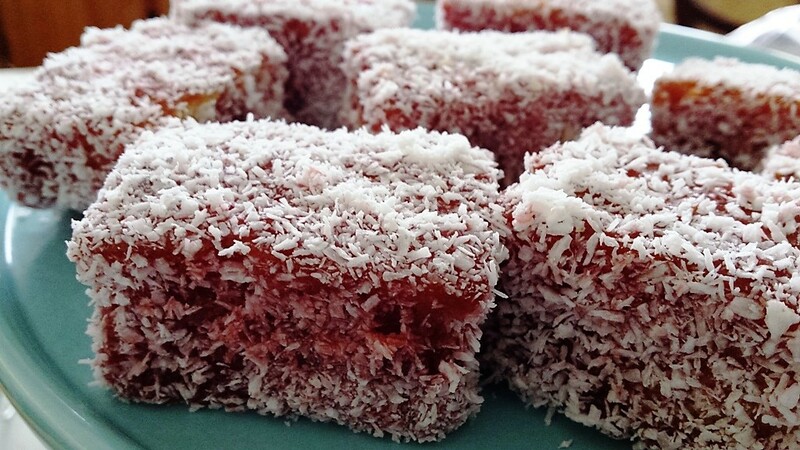 Put the desiccated coconut in large plate or tray. 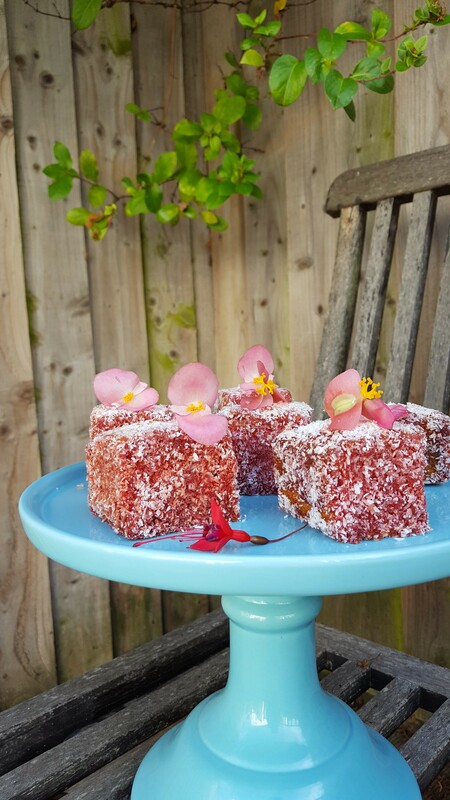 Taking one by one dip the sponge squares in the red colouring and roll in the coconut. Leave on a rack to dry while you continue with the rest. You can decorate with some butter cream icing and chopped nuts, the choice is yours. I prefer mine simple just the way they are.